I’ve noticed Long’s Noodle House a few years ago when I went to Au Petite Cafe to try their bahn me sandwiches. Long’s Noodle House is right next door! I went pretty late at around 8:30pm so it was pretty empty and they said that they were closing soon so anything we order would be last call. The interior is small and sparsely decorated with one wall covered in a mirror to make it look bigger. The menu isn’t too big but it has all the classic Shanghainese dishes. 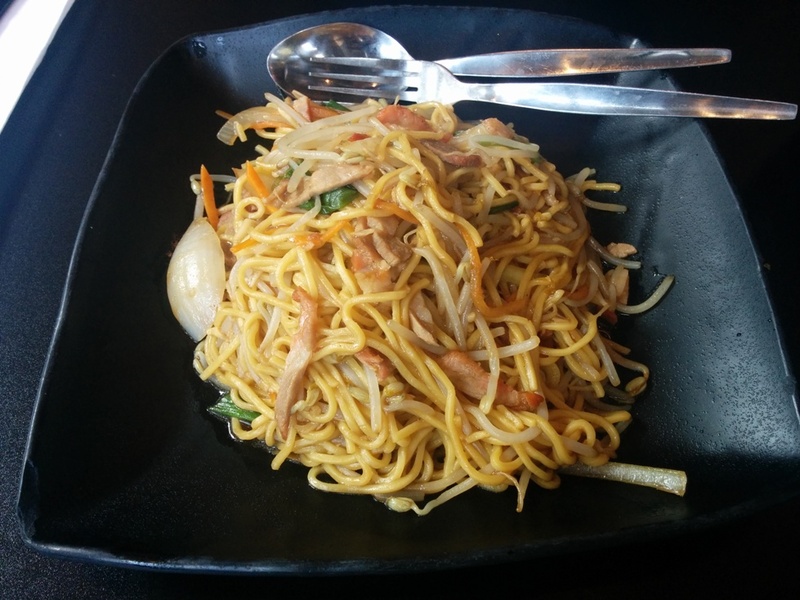 This entry was posted in Asian, Chinese, Food Reviews and tagged drunken chicken, noodles, XLB. Another old post that I never posted. Peaceful Restaurant, of Diners, Drive-Ins and Dives fame, has opened two more locations since they’ve been on the show. One is in the Mount Pleasant area on 5th and Quebec Street. Compared to the dingy interior of the original Broadway location, this one looks much more refined. Okay maybe not refined but the interior is simple, clean and spacious. It is also less busy than the original location. This entry was posted in Asian, Chinese, Food Reviews and tagged fried rice, noodles. Red Chicken is located under Ebisu on Bute and Robson Street. It’s sort of tucked away but not really. For your reference, Breka Bakery is also right across the street. 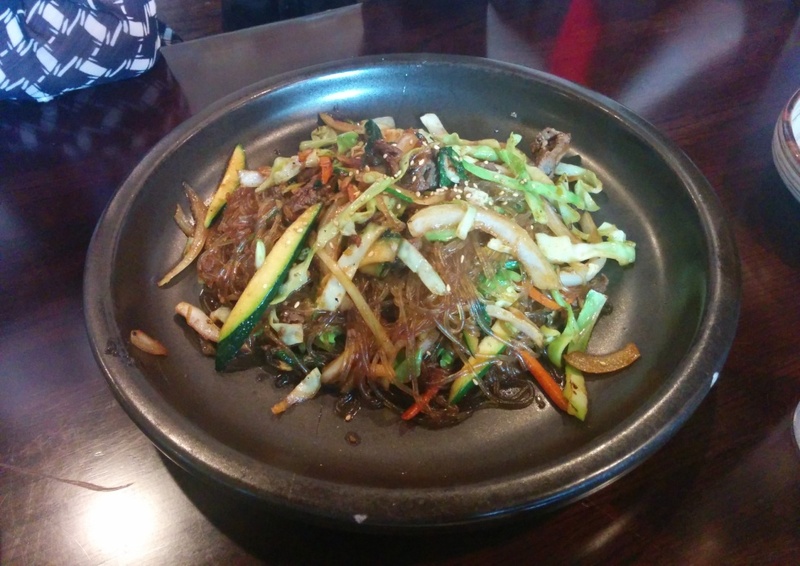 This entry was posted in Food Reviews, Korean and tagged fried chicken, japchae, Korean, noodles, seafood soup, spicy. 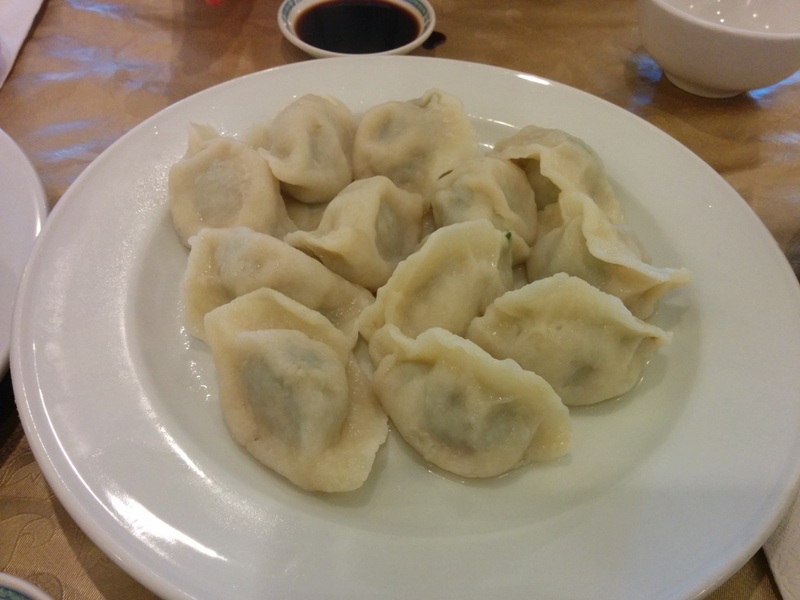 These were some Pork and Chive Steamed Dumplings. It came with 12 pieces. I wasn’t really into this since I prefer my dumplings pan fried usually and also the dumpling skin was also really thick too. Filling was flavourful though. This was the Ja Jiang Mein. I believe this was the Pushing noodles but I could be wrong. The noodles are really thick and chewy in a good way. There was a good proportion of meat sauce to noodles but I thought the sauce was different than what I expected (can’t really say how though). I just didn’t like it as much as I thought I would. 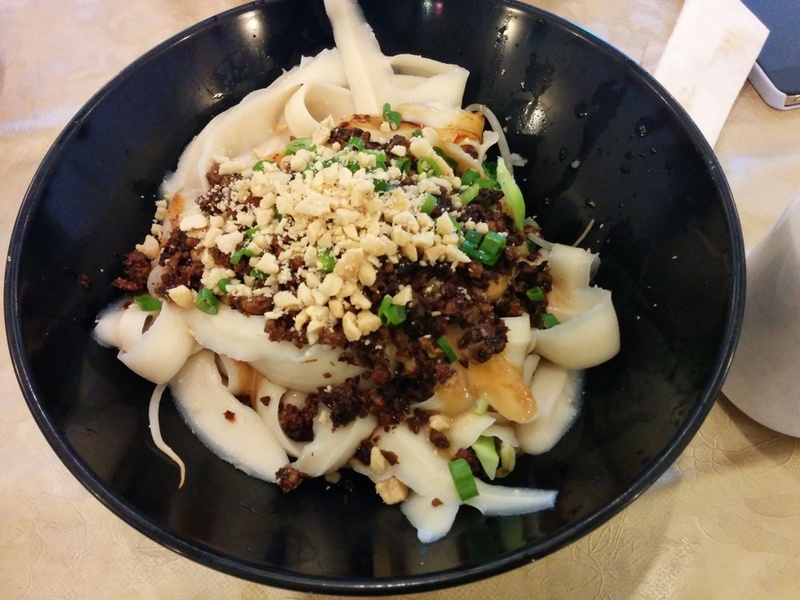 This was the Dan Dan Noodles with Cutting noodles. These noodles were flatter in shape but also equally chewy in texture. I preferred the Dan Dan noodles since it turns out I like the peanut flavour more than the meat sauce. The peanut sauce was smooth and thick enough to coat the noodles but it could’ve been spicier though. The noodle bowls were about $8-9 and the portions are really filling (for me at least) since there is a lot of noodles! It was also interesting to see the different types of noodles they had and I like how you get to choose which one you want. I wouldn’t mind trying some of their other fried noodle dishes. 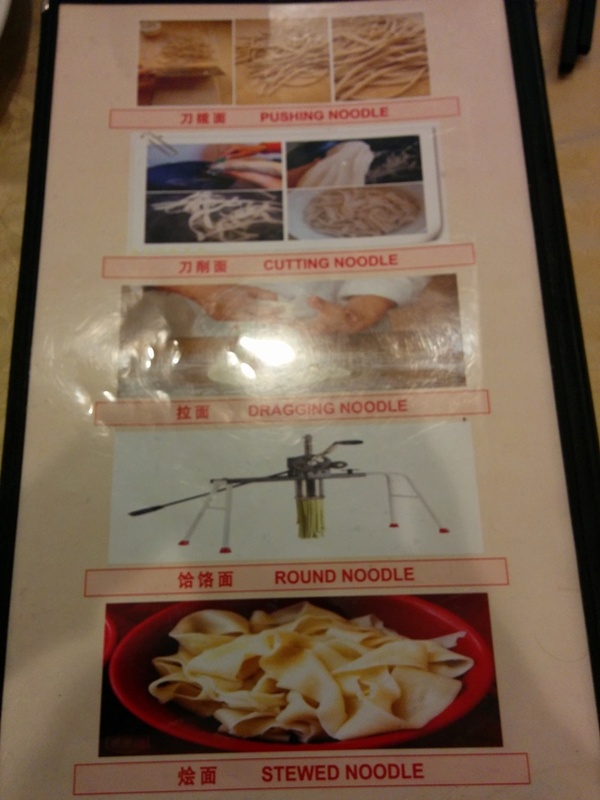 This entry was posted in Chinese, Food Reviews and tagged dumplings, noodles. 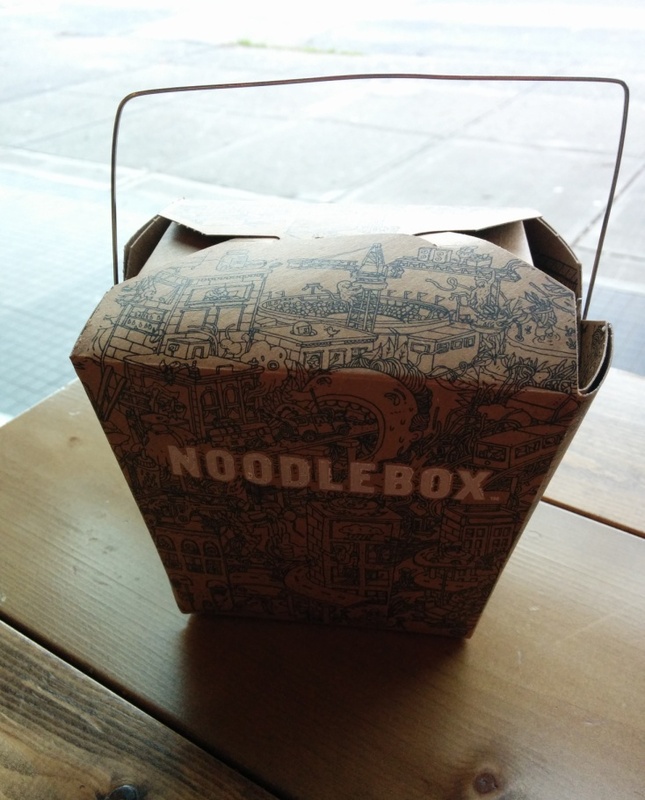 The Noodle Box opened up a new location on Main and Broadway this year and I had always been curious about it. 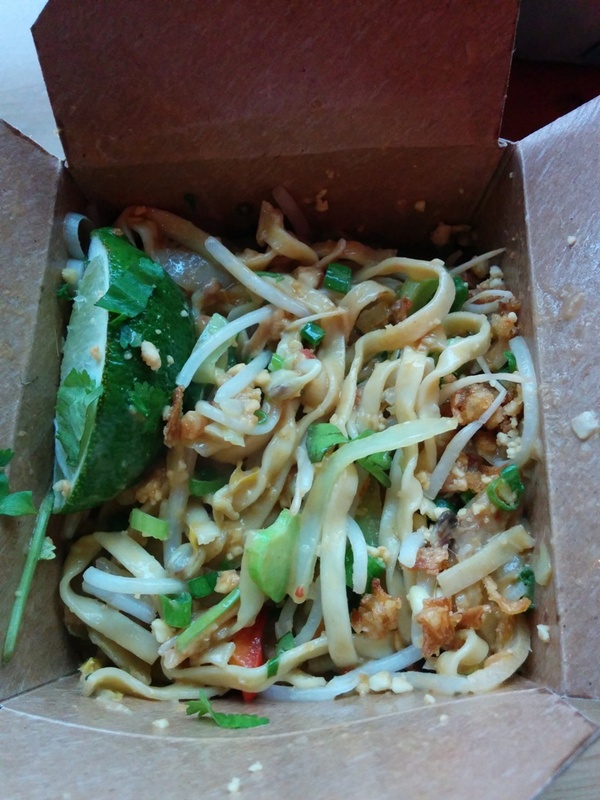 They serve Asian inspired noodles and I chose the Spicy Peanut Noodles to-go. 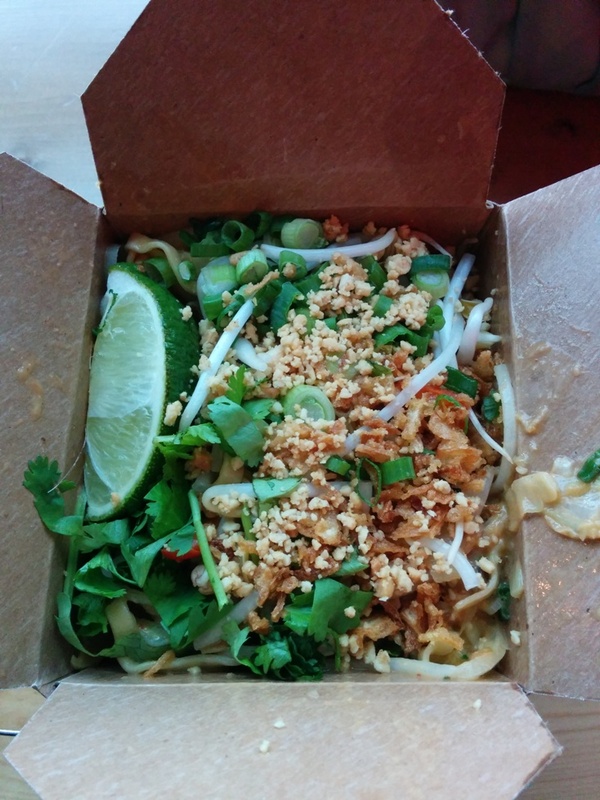 With each noodle bowl you have a choice of protein: Rossdown Chicken, Beef, Pulled Pork or Organic Tofu. I went with the pulled pork. It came in a cute take out container! The container says it can hold 30oz of food. When the noodles are served in a bowl at the restaurant the portion looks bigger but the box was pretty filling for me and I assume they would give you the same amount of food even though it looks like it’s less. The food was ready really fast. This is what it looks like when you open it. Everything is really packed in and there were lots of peanuts on top! The noodles are stir fried with bean sprouts, peppers, green onion, cilantro, peanuts and mixed with an Indonesian peanut sauce. You can choose your level of spiciness too and it ranges from mild to scorching hot. I picked medium and it was spicy enough for me especially since the noodles are hot it made it seem spicier. The peanut sauce was quite creamy and thick and I appreciated that they were a decent amount of veggies in here. The pulled pork was less noticeable since it sort of melted down? I think picking chicken or beef would be better. The only thing I didn’t like was the price. This was $12.50 and for a fast food place, I feel like I could’ve gone somewhere else for authentic Asian food with service for the same price or less. Especially since we have lots of Asian food in Vancouver! I liked the spicy peanut flavour and it was a filling meal but I’m not in a hurry to come back. This entry was posted in Fast Food, Food Reviews and tagged noodles, peanut sauce, pulled pork, spicy. I don’t think Richmond has many ramen places so it was nice that they opened one in Union Square beside Supermarket 2000. They had booth seats on one side of the restaurant! That’s rare for a ramen restaurant. The other side was more cramped though with some small tables right beside each other. If I was any fatter it’d be difficult to squeeze in to the seat on the wall side of the table. 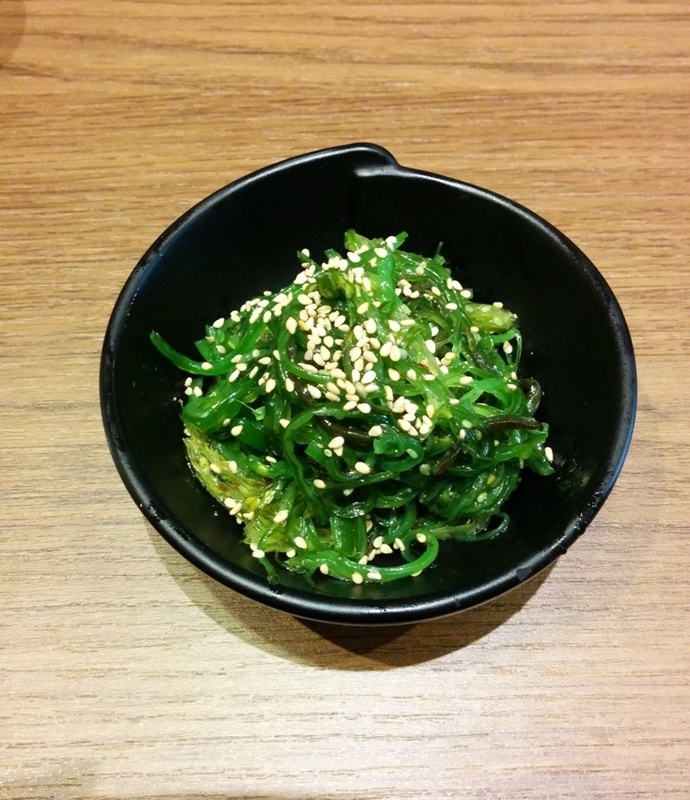 We had a Seaweed Salad as an appetizer. It was crunchy and had a nice sesame flavour. I should learn to make this myself. This entry was posted in Food Reviews, Japanese and tagged chashu, noodles, ramen, soft boiled egg, This. 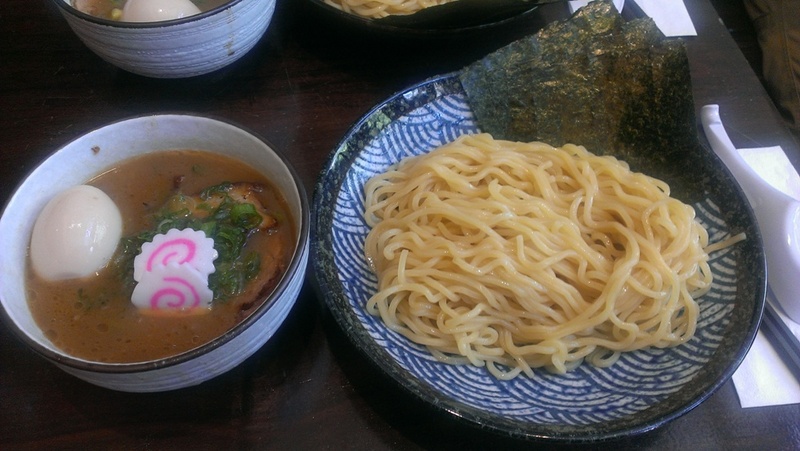 For our weekly Friday lunch last week we decided to try Taishoken Ramen near Tinseltown. Fortunately we got a table pretty quickly but they said that they only had 2 types of ramen left… It wasn’t even 1pm yet! Anyway the two they had left were tomato ramen and the tsuke-men. We were here for the tsuke-men anyway so that was fine for us. They also have a special version of the ramen where you can get a soft boiled egg added to it and I’m not sure what else was special about it.Their ramen comes in either a regular size or a large size. The ramen noodles are served cold and were quite chewy but in a good way. 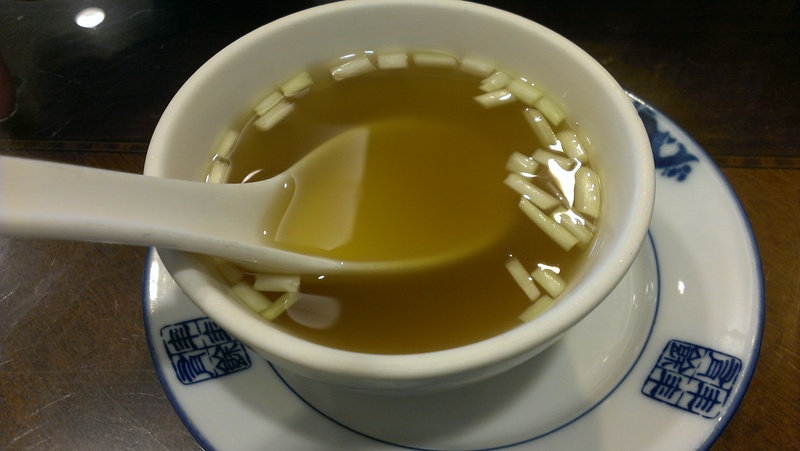 The broth was served on the side and although the portion looks small, it was very concentrated and full of rich fatty flavour. I opted for the pork shoulder and pork belly since I couldn’t decide so the waitress said I can actually get some of both. There was 2 slices of pork shoulder and 2 slices of pork belly and it was actually a lot of meat! The pork belly was mostly fat while the pork shoulder was lean meat but it was on the chewy side. Since the meat was in the broth, it soaked up a lot of the flavours from the broth. Besides the pork and egg, there were just some bamboo shoots and green onion. I wouldn’t mind going back to try their other dishes and they seem pretty big too! Price wise it’s about the same as other ramen joints. They are known for their dipping ramen though so you should give it a try! Gyozas will be on the menu soon. PS. Check out my GIVEAWAY for 3 gift cards to Yakinikuya BBQ if you haven’t already. This entry was posted in Food Reviews, Japanese and tagged noodles, pork belly, ramen, tsuke-men. 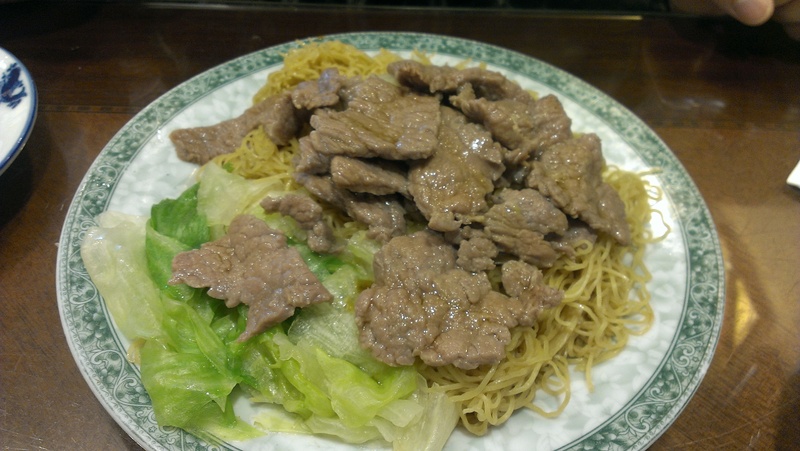 Michigan Noodle Restaurant is in the same complex as the ever popular Cattle Cafe and Deer Garden. I happened to come here spontaneously after trying to go to Haroo upstairs but there were no tables left and we didn’t want to wait. Conveniently enough, Michigan was downstairs and we got the last available table. It’s actually not that big inside either. They specialize in wonton noodles but of course I did not go for that. 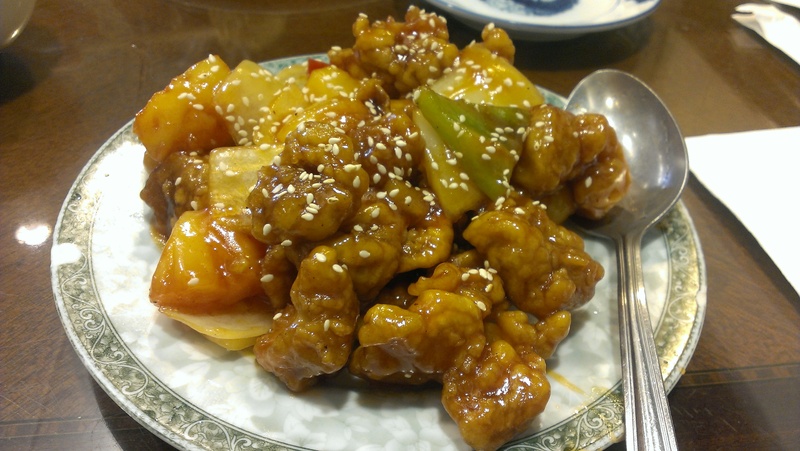 Instead, after deliberating for ages, I got… Sweet and Sour Pork. Yes I’m pretty boring and so many other dishes looked good but I went with something safe. =__________= It was also only $7.99! Actually they had a lot of $7.99 dishes that I was interested in. The pork was crispy and not overly sweet while the slightly sweet onions had a nice crunch along with the pineapples. Yum! Okay I promise I’ll order something else the next time I go!!! But you can’t go wrong with classics right? I had to order rice on the side though because it doesn’t come with any. My friend had “lo mein” (mixed noodles) with wonton noodles and beef. I was expecting more of a thick salty sauce instead of this light soup broth. It made the dish very light though and maybe more healthy? It was nice that it wasn’t premixed so you can add as much or as little soup/sauce as you want. The beef was also tender and lightly salted. Michigan Noodle Restaurant seemed like it had good options for wonton noodles as well as other dishes and service was very prompt as well. 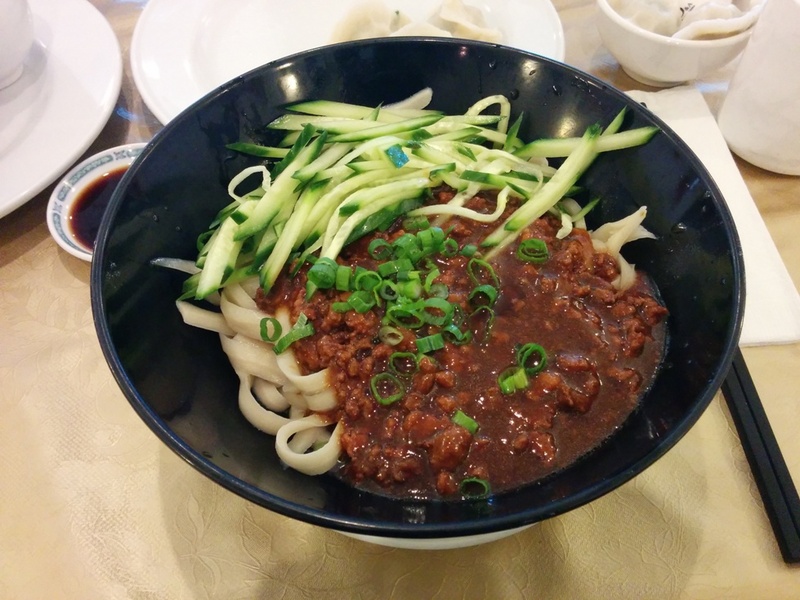 This entry was posted in Chinese, Food Reviews and tagged Michigan Noodle Restaurant, noodles, sweet and sour pork.